A little girl finds a red book on her way to school and picks it up. 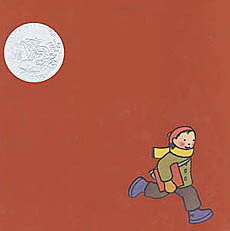 As she flips through the pages, she see illustrations of a boy on a beach who finds a red book in the sand, opening it, and flipping through the pages. Before long, the boy and girl realize they/re looking at each other! This book "a mind trip for tots" (Booklist) and a clever celebration of the power that books have to transport us to new lands and adventures, as that is exactly what happens to the two children in the story. This book received the Caldecott Honor in 2005! You may also want to check out other books by Barbara Lehman. To learn more, click on the book covers below or the author's name above.